The Italian plastics and rubber machinery, equipment and moulds industry reconfirms its status as a solid sector making a significant contribution to the national economy, particularly through exports. This news is all the more positive if we consider the context of a recession that has struck almost all sectors of Italian industry. The analysis by Assocomaplast (the Italian trade association, member of Confindustria, uniting some 170 companies) of ISTAT data on foreign trade in January-September 2014 highlights growth in imports and exports, that had already begun in earlier months, with respect to the first three quarters of 2013. In the first nine months of 2014, sales abroad reached 1.89 billion euros, as opposed to the 1.82 in the corresponding period in 2013, recording growth in excess of 4%. Imports for the same period grew by an impressive 7 percentage points: from 423 million euros in 2013 to over 454 in 2014. This corresponds to consolidation (+3%) of an already strongly positive balance of trade. Expectations for the current year, despite the rapidly shifting political framework and uncertainties in the markets, are marked by optimism. While some countries, for various reasons, are navigating through a delicate period (Russia primarily, but also Brazil and South America in general and, in certain respects, China as well), others are witnessing significant recovery (the United States first and foremost).Furthermore, the recent moves by the ECB are inciting hopes for a resurgence also in Europe. 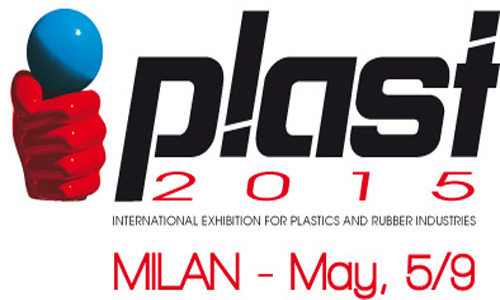 This positive situation for the plastics and rubber sector is reflected in the expectations for growth in participation in PLAST 2015, the historic tri-annual fair that will be held this year in Milan, in concomitance with the inaugural week of EXPO 2015, 5-9 May. 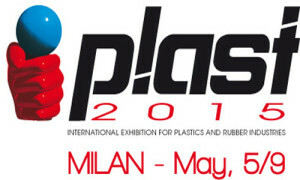 At just under 4 months from the cutting of the ribbon for the Milanese fair, the number exhibitors has exceeded 1,200 (+3.9% with respect to the same period three years ago) with full, across-the-board representation of all the different segments and categories in the six PLAST 2015 pavilions. This is yet further proof of the capacity of this industry to continually regenerate itself and attract new exhibitors and visitors.